It might seem strange to start off a holiday missive with a song that came out for Tiananmen Square. But then maybe this message isn't for you. Primarily, this hark and herald is a shout out to the beautiful souls still with us at Deadly Serious, for precious ones we have lost, and the dear ones still out there who may some day be our friends. Let's do something radically different this holiday season. Bruised and broke, fallible, fainting, one and all, before we exit, let's give Christmas - and every last day - a meaning worthy of the martyr's death. The real message of Jesus wasn't that society as usual is good or good enough. It wasn't that if you climb over your neighbors and get to the top of the heap, and end up President or Emperor or King, that the suffering of life will end and you'll actually have arrived. Not even close. Human society as we know it is irrelevant in the eyes of Good. And Salvation - whether in this world or the next - comes from actually living that way. So I say we start dancing. Dancing in front of the guns. Dancing away our awareness that there even are guns. Dancing until we're having so much fun dancing that no one even notices the guns. Dancing until the people who control the guns actually get it that they would rather be dancing too. Dancing until the guns become so heavy in the arms of those compelled to carry the guns that their hearts ache more than their arms and they long to set guns down and hold hearts up. Dancing until lightness and the spirit of our dancing stars - earthly and eternal - makes for a human race that can no longer hold up guns even if it wanted to. I can't follow the steps. The beat I hear in my ears is never in time with what others are clapping to. But I still want to dance. I love the music and my feet want to move. I love the idea of having fun together like this. I, like others, want to play too. Maybe we could both try. Even if we step on some toes out on the floor in front of the tanks while we're both trying to learn how to dance together. Maybe we could cut each other a break. Use the tanks to break down some walls, instead of each other. That was part of the original Message from the original Messenger too. But even more than that, I really just want to dance. There's music in this soul that's dying to get out. It's Deadly Serious about that. It will kill me if I don't listen. So even if you don't hear what I hear. Even if nobody ever does. Even if I walk out on the floor or a limb like this and no one else joins in. It's time for me to dance. ~Your distress ~Your wisdom ~Authenticity ~Honoring our journeys ~Challenging social norms ~Genuine curiosity ~No assumptions ~Respecting differences ~Meaningful community ~Hope ~No authorities ~No "crisis intervention"
Following is a draft format that some of us are trying out for leaderless International Peer Support groups that can be held on line or in the community. Welcome to the IPS Learning and Practice Group. We’re glad you’re here. Intentional peer support (IPS) is a way of thinking about and being in purposeful relationships. In IPS, we use our relationships to look at things from new angles. We develop a better awareness of personal and relational patterns. We support and challenge each other as we try new things. IPS is different from traditional service relationships because it doesn’t start with the assumption of “a problem.” Instead, we learn to listen for how each of us has made sense of our experiences. Together, we create new ways of seeing, thinking, and doing. At the end of the day, it is really about building stronger, healthier communities. How are people doing this week? If you’re new here, what drew you to this group? What are you looking for? Ask questions about the topic that help the group to develop what it means. The idea is to figure out how I want to practice the concept when I'm relating to others. Also, to let others in the group know how I want them to practice this concept when they are relating to me. · “What does [the topic] mean to you…? · “How does it make you feel when someone approaches you this way (or doesn’t)? This is a time where we can practice what we’ve been discussing with each other. Does anyone have an example from real life they want to share? Then the rest of us can practice 2 ways. First, by playing around and doing the opposite of what this skill means to us. Then by doing a redo and really trying to practice the skill to the best of our ability. Ask: "Is anyone willing to go first? Ok go ahead and share your situation. Be prepared though. Because first everyone else, give the worst responses they can think of." After 5 minutes, ask the sharer: What did you notice. How did that feel? Ask the shared: Can you continue your sharing from here. Except this time, everyone try to really practice the skill we are working on. After 5-10 minutes, ask the sharer: What did you notice. Did that feel the same or different? How so? Give as many people turns as time allows. About 10 minutes before the end of the group, announce: We’ve got about 10 minutes left. Then reflect together as a group, about how the group felt to people. Is there anything on anyone’s mind that feels unfinished or important that you want us to get to before the group ends? How did the group go for you? Anything you want to should remember for next time – either that worked really well for you, or that you might want to change? Thanks for being here! Have a great week. IPS is a way of thinking about and being in purposeful relationships. In IPS, we use our relationships to look at things from new angles. We develop a better awareness of personal and relational patterns. We support and challenge each other as we try new things. IPS is different from traditional service relationships because it doesn’t ,start with the assumption of “a problem.” Instead, we learn to listen for how each of us has made sense of our experiences. Together, we create new ways of seeing, thinking, and doing. At the end of the day, it is really about building stronger, healthier communities. Each week we focus on a different topic from the IPS Workbook: Intentional Peer Support: An Alternative Approach by Shery Mead. (No purchase is necessary - the relevant text is made available at each meeting.) We use the reading to focus our attention and spark discussion about important concepts in peer support. We learn together from the reading and the experiences we share. We explore how we might apply what we are learning to the real issues in our lives and also to support each other to navigate our challenges meaningfully and well. 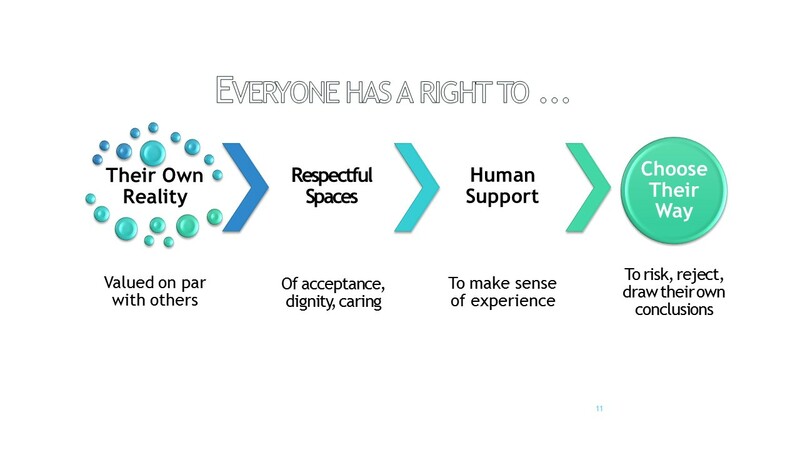 Our aim is to build a supportive, mutually responsible peer community capable of negotiating different needs, values and views of reality with dignity, rights and personhood fully in tact for all concerned. IPS encourages the use of 'Discomfort' Agreements, moreso that 'Comfort' Agreements. This is because learning new things is often uncomfortable. New learning usually requires sincere effort and a willingness to stretch beyond the known into the unknown. The IPS Discomfort Agreement acknowledges this challenge, as well as the temptation to quit when the going gets rough. the Discomfort Agreement thus supports us to stay with the process by helping us to think, intentionally, ahead of time, about the kind of environment we want to create in order to support and facilitate new learning. One person talk at a time. Listen to understand and relate rather than to help or convert others. Participate to the level of your comfort (self-care). Keep the focus on learning and practicing Intentional Peer Support. Don’t make assumptions or put words in people's mouths. Instead: ask, reality check, validate. There is no right or wrong here in the sense that sincere discussion and questions are welcomed. However, apparent power imbalances, unfairness or nonconsensual treatment of others can and should be respectfully questioned. When controversy arises, explore differing viewpoints with curiosity about the personal experiences that led others to see things the way they currently do. Work to transcend disagreement by learning about the realities of others and finding points of connection. Being respectful of modalities that others find useful and refrain from promoting or denigrating specific approaches. Stay away from debates about pharmaceuticals, healthcare or politics. “Stretch”: Step up if you tend to stay in the background, step back if you tend to take up a lot of space. “Ouch”: If it hurts say so. Be conscious of how you use power or privilege, as well as open to hearing from others about how they may experience you using it. Use power to support and grow relationships rather than to gain personal advantage or prestige. Don’t scapegoat or marginalize anyone. Promote equality, fairness and understanding. Reach out to include others who may have less power or privilege than you have. Some here may prefer to type in the chat box instead of speak out loud. You can access the chat box from the control panel at the top or bottom of your screen. If you don’t want your comments read out loud, please let us know. Otherwise, we try to read them in real time so they can be part of the conversation. Everyone is encouraged to pay attention to typed comments and read them. A major purpose of this group is to encourage conversation, create space for diverse viewpoints, and make sure everyone has a chance to speak. If you have something to say and someone else is speaking, please raise your hand. Other members are encouraged to notice to when someone has their hand raised and call attention to that in a sensitive way if the speaker doesn’t seem to notice. Group members are encouraged to bring bells or musical instruments and use them for this purpose if the someone has gone on for several minutes. We recognize that there are times if life where any one of us might feel the need to speak at length about matters that concern us. If that appears to be the case, anyone may request or suggest a breakout room where two or more members can have a private conversation. Alternatively, anyone may request or suggest that a particular issue be discussed further after the formal group meeting. Moderation of the group is shared by group members. At the end of each group we ask for a volunteer to moderate for the upcoming session. If that person is able to make it, we ask for volunteer to moderate when the next session starts. Those new to moderation are encouraged to try their hand at moderating once they become familiar with the group process. All group members are encouraged to use the peer support skills we are learning to support the moderator or to respectfully share needs or concerns that seem important to them. What my 'defaults' when the going gets rough in my relationships with others? What do I tend to do when I feel scared, uncertain or overwhelmed? How does this usually work out for me? What usually happens in the relationship? What would I like to do differently in the future..? If I carefully consider these questions, I may well come away with a specific, personal learning and practice objective for myself for the group. Stay with the learning/ practice process, remaining both true to our experience and respectful of others, when we feel uncomfortable. Keep our commitment to ourselves to try to do something different if/ when we fall back into old patterns. Step up when find something hard or feel like running away. Step back when we want to dominate or think we have all the answers. If I carefully consider these issues, I may well come away with some specific requests I make can to other group members that will help them - and me - to notice when I'm stuck in old patterns and navigate them differently. 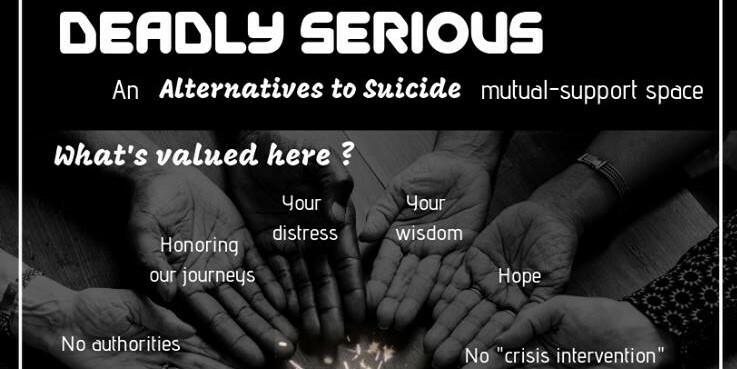 The kind of peer support we are learning about in this series assumes that all of us - helpers, helpees, family, friends, community members, professionals as well as those of us with identified social concerns like suicide - have things to share and things to learn. It assumes that risk is a part of living and that we all take risks as well as create them -- both for ourselves and for others. It assumes we all have power -- as well as a mixed record when it comes to the choice of taking power for ourselves, giving it up to someone else, or negotiating and sharing it with others. See-feel-need is a variation on nonviolent communication that's been adapted to the mental health context. The reason for the adaptation is that, in mental health situations, it's fairly common that we're both not in the same reality. Often, I'm seeing, hearing, believing, feeling or sensing something that you don't. For example, with regard to suicide I might experience impending doom, see myself as totally worthless, believe that others have decided to intentionally target and torture me, know that my life is over and that nothing I do will ever make a difference. You might see me as a bright, capable 30 something who hit a streak of bad luck and is taking the ordinary hard knocks of life a bit too personally. If your experience around this is anything like mine, we can argue about our different viewpoints forever, get nowhere and end up with both of us in more pain than we started despite our best efforts and deep longing for connection. This is simply owning up to the thoughts going on in my head about a situation. It includes my beliefs about what is happening between us. It also includes anything concrete that I've observed (read, seen, heard, felt, touched, smelled, tasted, etc.) that I'm focusing on to support my thinking. My beliefs and observations may ring true for you too, or they may not. The point is that they are real for me, and they impact how I'm experiencing our relationship. So I own them as my thoughts. Does any of this make any sense to you? Do you have some time to talk about it? Would you be willing to tell me how you see things? Do you see it the same as I do or differently...? Did you notice that I left you and your reality out of what I said to you? I stuck with my own reality and my own needs. I said only what I was seeing, feeling and needing. I owned my beliefs as my own and didn't assume that you believe the same things I do. I didn't assume that my observations, feelings or needs hold true for you too. I didn't assert that my observations, feelings, beliefs or needs mean that you are doing something wrong or that there is anything you have to change. how this was leading me to want to respond to you as a human being. how what you were experiencing was similar or different from what I was experiencing. Practice having a see-feel-need conversation. Two people can role play a conversation or everyone can take turns jumping in with new lines. Notice the responses that make you feel more or less safe. Discuss this as a group at the end. Relational WRAP: Helpful hint. Create a relational ‘crisis’ plan ahead of time. This is essentially something along the lines of a Wellness Recovery Action Plan that two or more of us can create together for our relationship. Once we have one, we can refer back to it in difficult times and just follow what we agreed to until we are out of hot water and have some space to think things through. After we’ve come through a difficult situation and we’re on the other side, practicing open honest communication is still important. We both probably have some feelings about what happened. We maybe even created a little mistrust and now need to re-establish what’s going to work for both of us. Examine our own reactivity to these kinds of situations, and then mutually negotiate a new response. Each of us own our own hot buttons (triggers, sore spots, pet peeves) and plan for how we’ll deal with them differently next time. Explore (re-explore) what risk and safety mean to each of us and how we will share responsibility for addressing these needs in ways that work for all concerned.